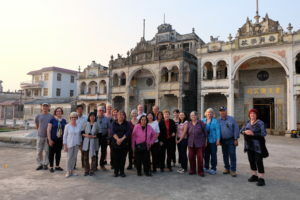 In January 2018, Sophie Couchman and I hosted our second Chinese Australian Hometown Heritage Tour to Hong Kong and Guangdong. 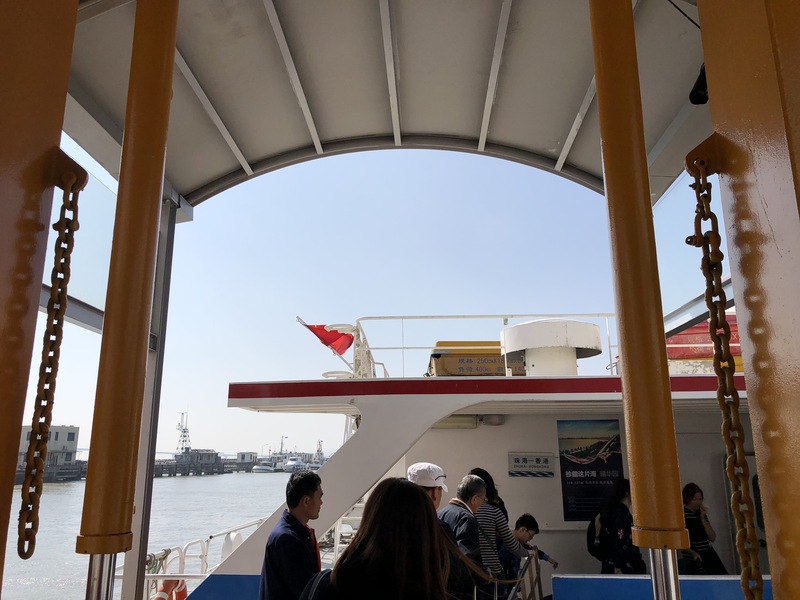 The tour ran for eleven days, from 14 to 24 January 2018, and visited Hong Kong, Jiangmen, Kaiping, Taishan, Xinhui, Zhongshan and Zhuhai. 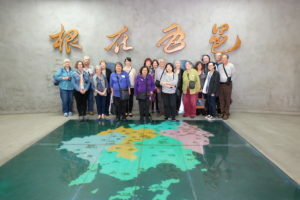 We were joined on the tour by seventeen guests, from New South Wales, Victoria, South Australia, Queensland and the UK – most of whom were descended from early Cantonese migrants to Australia. 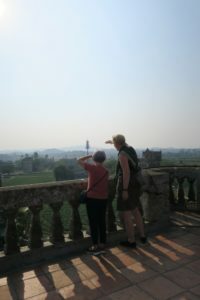 One of our guests was on the tour for a second time. Our local tour guide was Stony Xiao from China Adventure Tours, with arrangements and bookings coordinated by Active Travel in Canberra. For the Chinese characters and Cantonese pronunciation of the names of places we visited on the tour, see this glossary of place names in Chinese (pdf, 1.6MB). You can find out more and join our mailing list if you’re interested in joining us on a future tour. 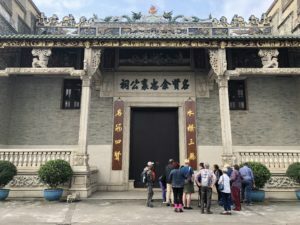 King Yin Lei, Stubbs Road, Mid-Levels: We started the tour by visiting this magnificent mansion, built by Ballarat herbalist Frank Shum Goon and his wife in 1936. 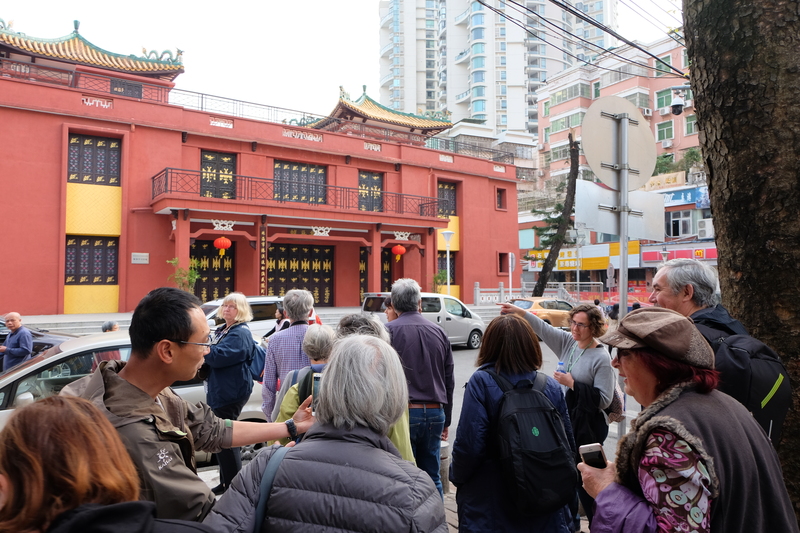 It narrowly escaped demolition in 2007 but was thankfully saved by Hong Kong’s heritage-minded citizens. It is rarely open to the public but we were treated to perfect weather and a magnificent view from the street. 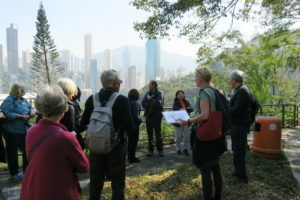 Hong Kong Cemetery, Happy Valley: Sophie led us on a Chinese Australian walking tour of the cemetery – we started at the top and wove our way down to the main gates opposite the Happy Valley racecourse. Among more than 12,000 graves in this beautiful ‘garden cemetery’ are a significant number of Chinese Australians who built lives in Hong Kong after leaving Australia. 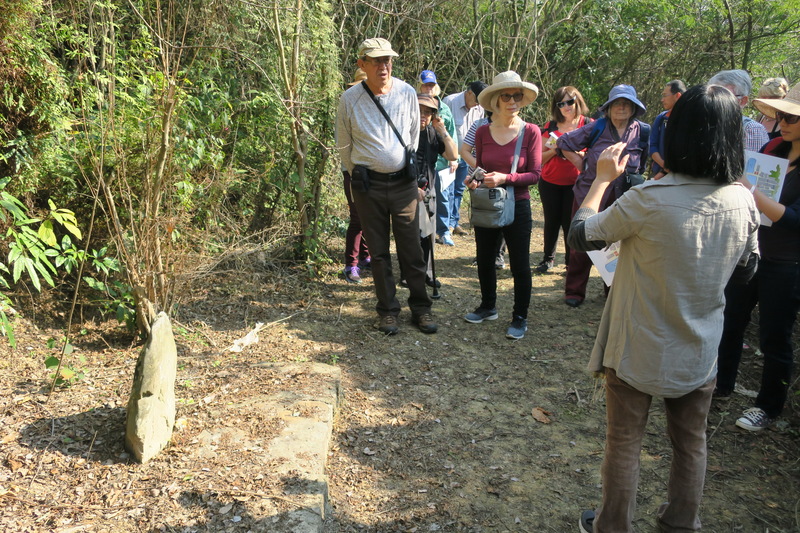 Hong Kong Cemetery, Happy Valley: Pauline Rule shared her knowledge about Australian Jane Benson, the wife of Chun Yut, who is buried in the cemetery. One of the exciting aspects of the tour is the knowledge our tour members share with us and each other. On the bus from Zhongshan to Jiangmen: Some on the tour were old China hands and others were setting foot on the mainland for the first time. 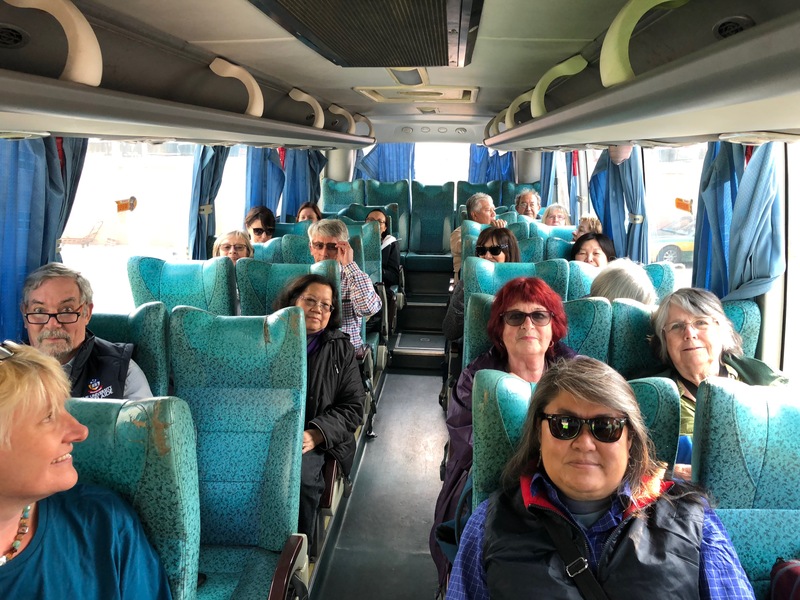 People-watching out the bus window, and lively conversation inside it, quickly became part of the tour. Wuyi Overseas Chinese Museum, Jiangmen: At the entrance of this terrific bilingual museum, where we got an overview of the breadth and significance of overseas Chinese migration from the Sze Yap region. Wuyi Kitchen, Jiangmen: A taste of what was to come – food and architecture are a big part of the Hometown Heritage Tour! Cangdong village, Tangkou, Kaiping: We took advantage of the beautiful weather to explore the village environs with Dr Selia Tan. Selia told us about the uses of local plants, the feng shui of the village and the various shrines placed on the village boundaries. 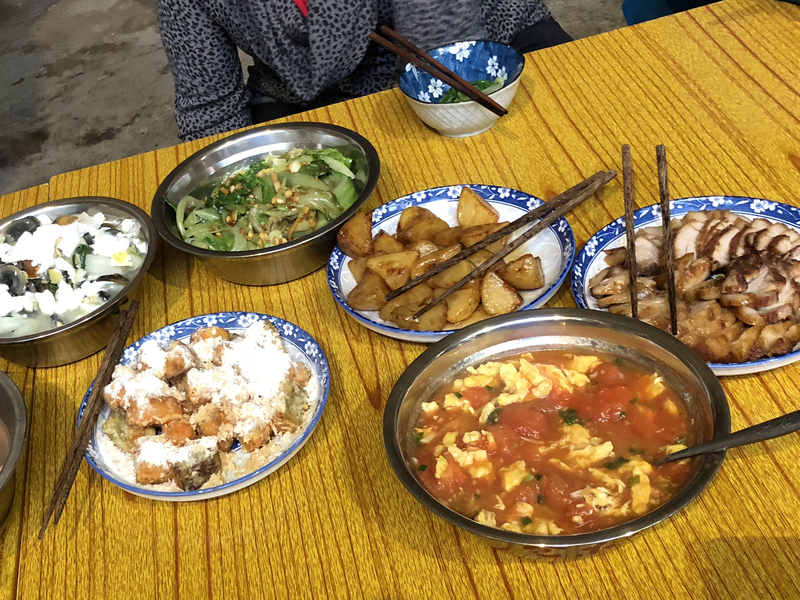 Cangdong village, Tangkou, Kaiping: It didn’t take long for these local dishes, prepared by the Cangdong village women, to be wolfed down! Kate was particularly happy to be fed such a delicious and diverse range of vegetarian dishes. Zili village, Tangkou, Kaiping: Taking in the view from the top one of the UNESCO World Heritage-listed mansions in Zili. 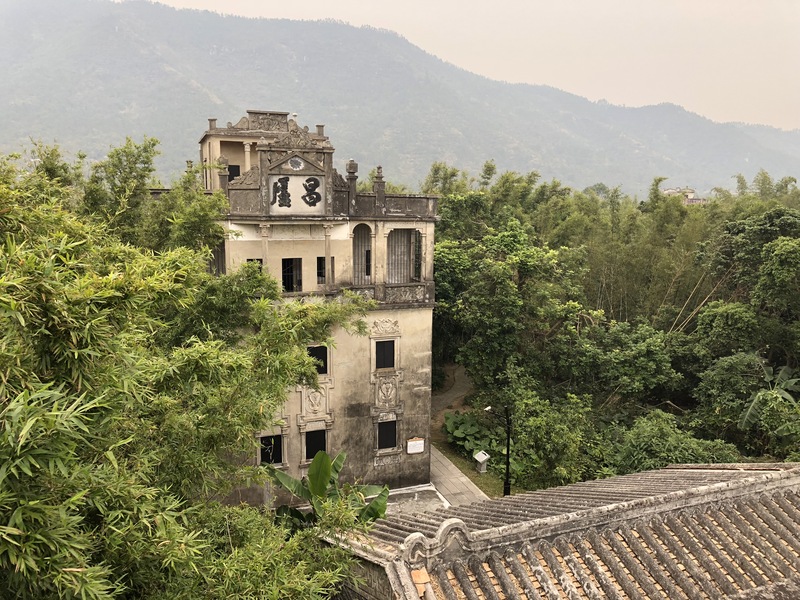 Built by overseas Chinese in the early 20th century, these mansions and diaolou (defensive towers) blend Chinese and Western architectural styles and building methods. 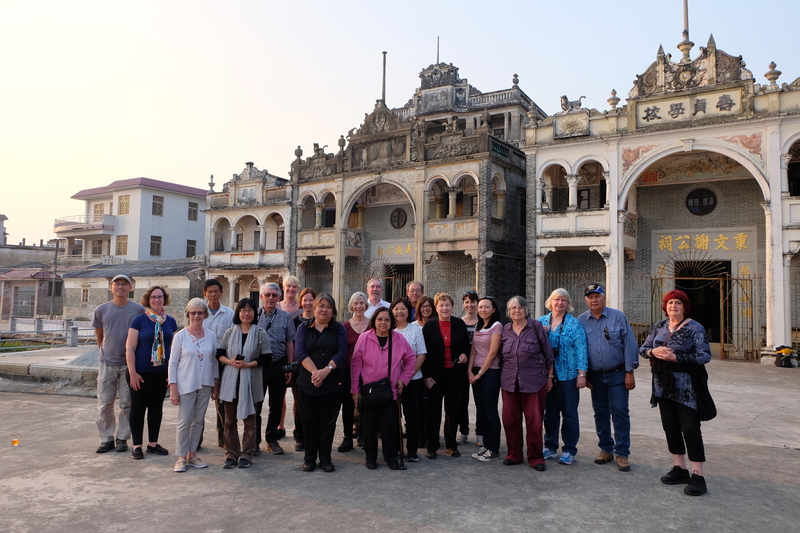 Cangdong village, Tangkou, Kaiping: We were fortunate to spend two busy days full of food, talks, craft and music at beautiful Cangdong village. 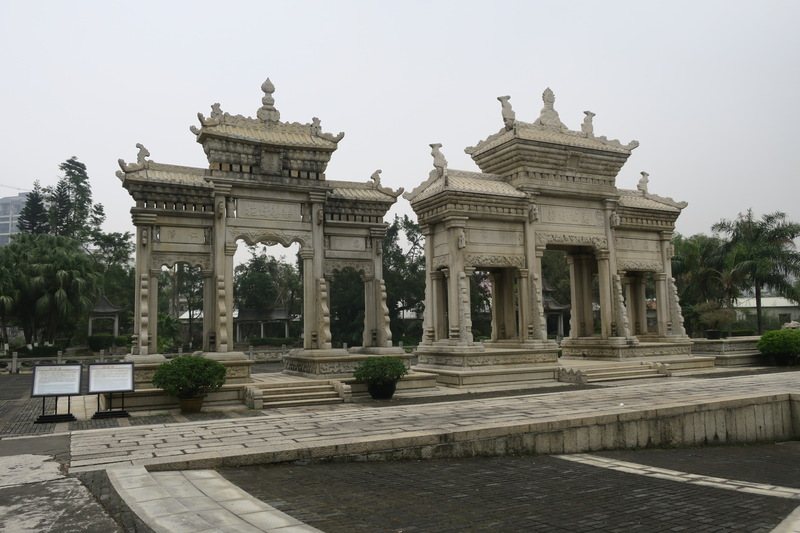 Cangdong is the ancestral home of Sydney-born Chinese Australian revolutionary Tse Tsan-tai. 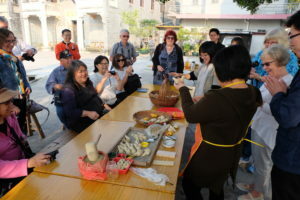 Cangdong village, Tangkou, Kaiping: One of our favourite tour activities is making, and blowing, clay chicken whistles. The art of making this once-popular childhood toy was on the brink of disappearing, but has been revived thanks to the Cangdong project. Cangdong village, Tangkou, Kaiping: We finished our second day in Cangdong with a Cantonese opera performance under the banyan tree – and Sophie made a new friend! 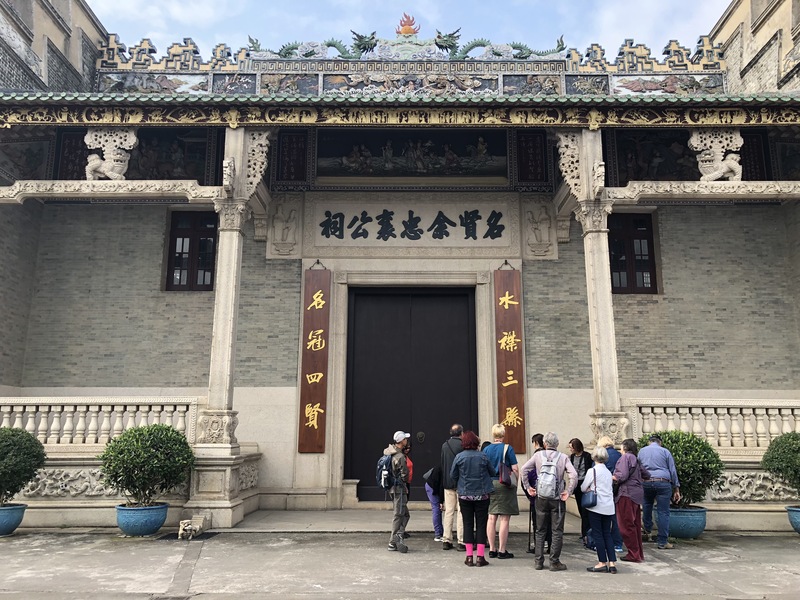 Fengcai Tang, Dihai, Kaiping: A special treat for our tour was having Selia Tan talk with us about the heritage significance of this magnificent ancestral hall, built by the Yee clan, now on the grounds of a high school. Many Yees from Dihai made their homes in Australia and New Zealand. 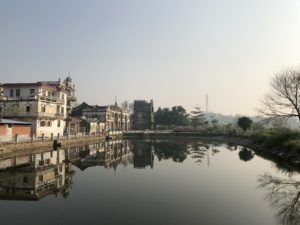 Majianglong village, Baihe, Kaiping: UNESCO World Heritage-listed Majianglong village is surrounded bamboo – dense, protective, and beautiful – offering us very different views from those in Zili village. Among the bamboo we even discovered a school with Australian links! Yueshan town, Kaiping: We might have already eaten a fullsome lunch but that didn’t stop us all enjoying these freshly baked goodies, on sale every afternoon from three o’clock in Yueshan. As well as the ever-popular egg tart, we found pineapple buns made with chunks of real pineapple! 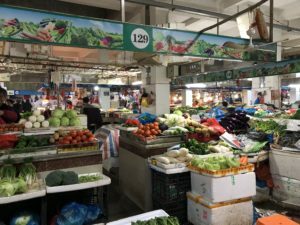 Meijia Dayuan, Dingjiang, Duanfen, Taishan: We visited the stunning Mei family market square on a Saturday and it was busy and bustling. 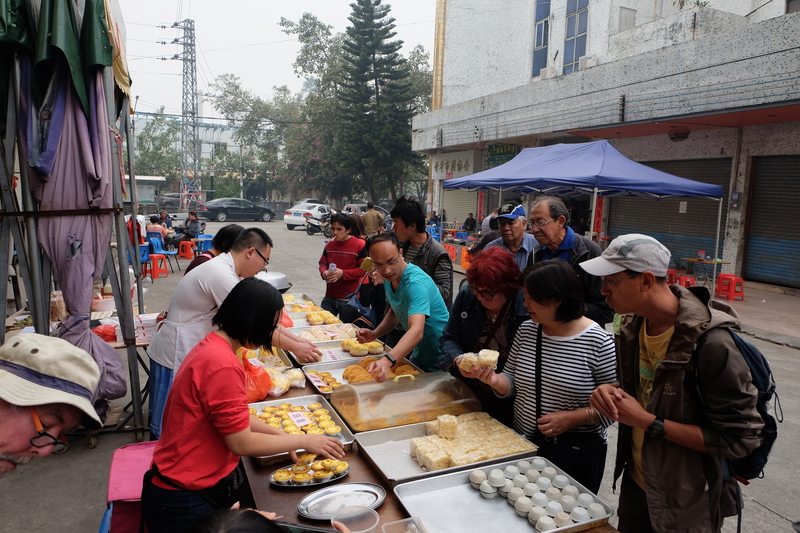 Like at Yueshan there were plenty of local goodies for sale, except here it’s now on offer for tourists and day-trippers. 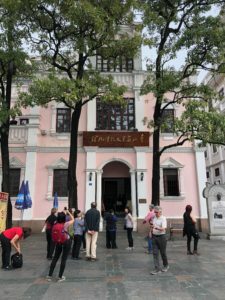 Haikou Pier and Silver Letter Museum, Haikou, Taishan: We like to do a bit of exploring on our tours, and this museum had only just opened. 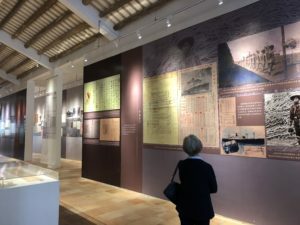 There’s lots of great historical material on display, but no English, so Stony provided us with an excellent overview and translated text panels on the run. Wet market, Nanchang Street, Taicheng: On the tour we have plenty of opportunities to experience everyday life in southern China, such as the shops and markets in the backstreets of Taicheng, the capital of Taishan county. 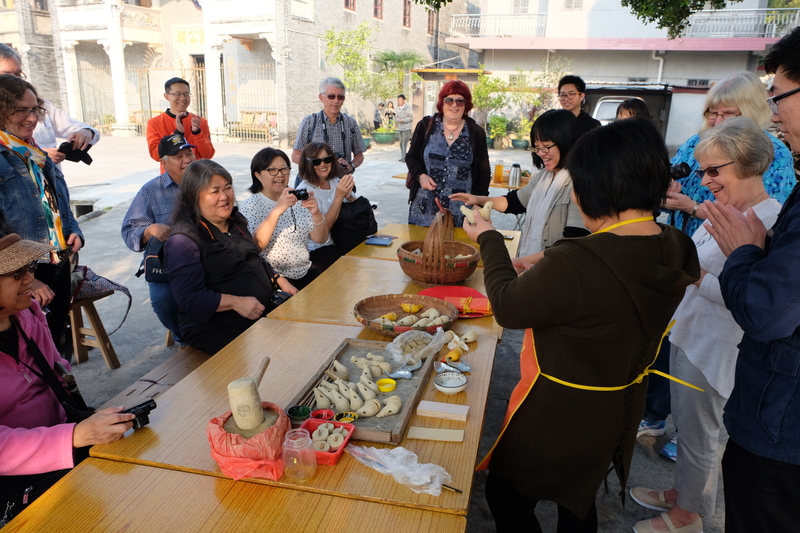 Shiquli village, Luokeng, Xinhui: One of the special things for Kate on the tour is bringing the group to Shiquli, a village whose Australian connections she has been researching for almost a decade. 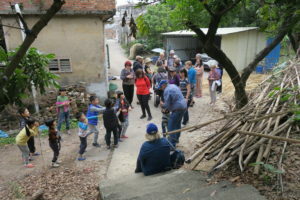 Since we were there on a Sunday, the village kids weren’t at school and they followed us as we were shown around the village by former village head, Chen Ruihuai, aka ‘Grandpa’ Chan. 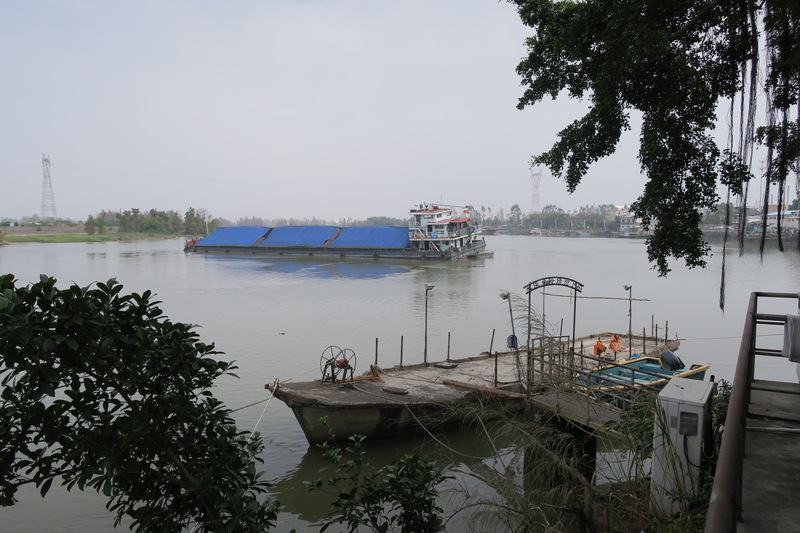 Luokeng, Xinhui: We ate lunch overlooking a branch of the Tan River at Luokeng – while not as vital as in the nineteenth century, river culture is still an important part of life in the region. 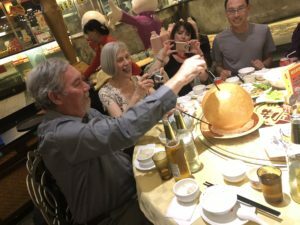 Shiqi Lao restaurant, Zhongshan: Food as performance art! 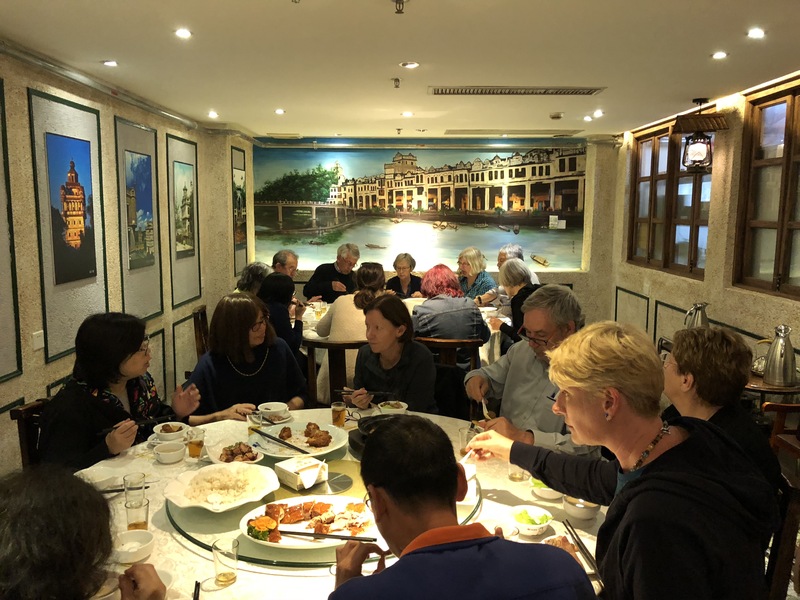 Zhuxiuyuan, South District, Zhongshan: The Kwok brothers from Zhuxiuyuan founded the famous Wing On department stores in Hong Kong and Shanghai after business success in Sydney. We saw an expression of their wealth in this house built in their home village, now a suburb of Zhongshan city. 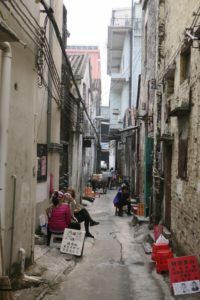 Shiqi, Zhongshan: There are lots of hidden sights down the laneways off Sun Wen Road in Shekki, the old part of Zhongshan city – these women do facial hair removal by ‘threading’. 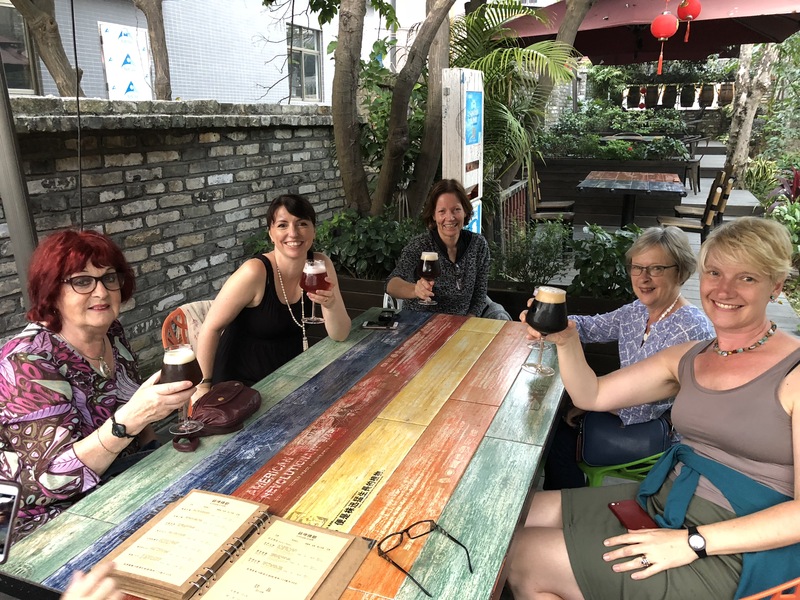 Sanxi village, East District, Zhongshan: Enjoying a drink at the microbrewery before dinner. Xiangshan Commerical Culture Museum, Shiqi, Zhongshan: The top floor of this museum tells the story of the four major Shanghai department stores, established by Zhongshan-born Chinese who learnt their skills and raised their capital in Australia – the Mas, Kwoks, Choys and lastly the Lees and Lius. Museum of the Former Residence of Sun Yat-sen, Cuiheng, Zhongshan: As well as stories about Sun Yat-sen’s childhood in Cuiheng and his later career, this museum contains displays about Zhongshan domestic life and culture. Meixi Paifang, Meixi village, Xiangzhou, Zhuhai: These ‘paifang’ or archways were presented by the Qing government to Chun Afong, the first Chinese consul in Hawaii, for his benevolence and good works in his hometown. 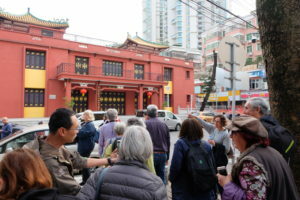 The nearby museum highlights the interesting lives of Chun Afong and his mixed-race Chinese-Hawaiian family. Hong Kong-Macau Transient Fishing Culture Exhibition Hall, Xiangzhou, Zhuhai: We visited this former dragon boat pavilion as part of Kate’s Zhuhai walking tour – as a museum it now tells the history of Old Xiangzhou and the Tanka fishing communities of Zhuhai, Macau and Hong Kong. 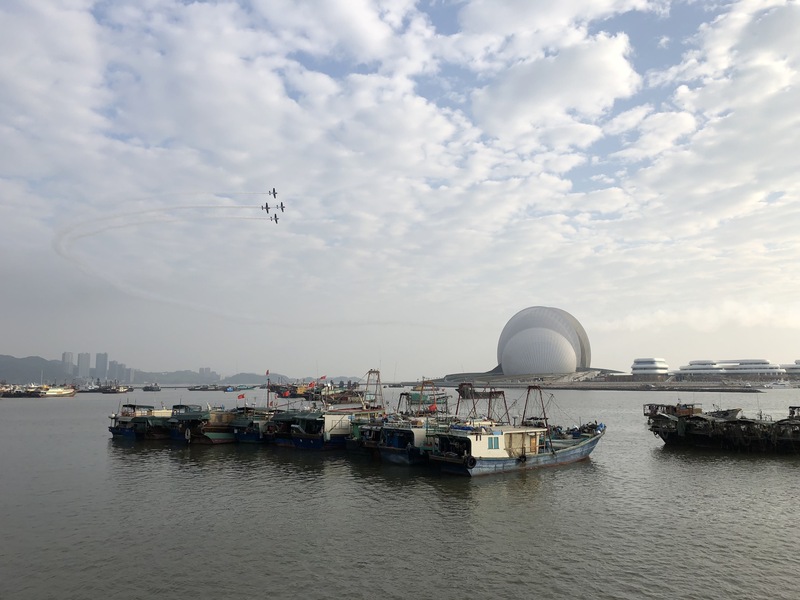 Xiangzhou, Zhuhai: We were treated to an aerial display over the Zhuhai Opera House and Xiangzhou fishing port – the port will soon be relocated to make way for a luxury marina. 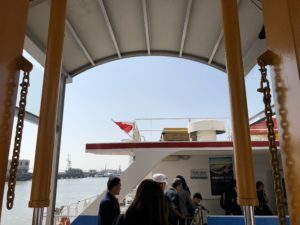 Jiuzhou Port, Zhuhai: Heading back to Hong Kong by high-speed ferry. 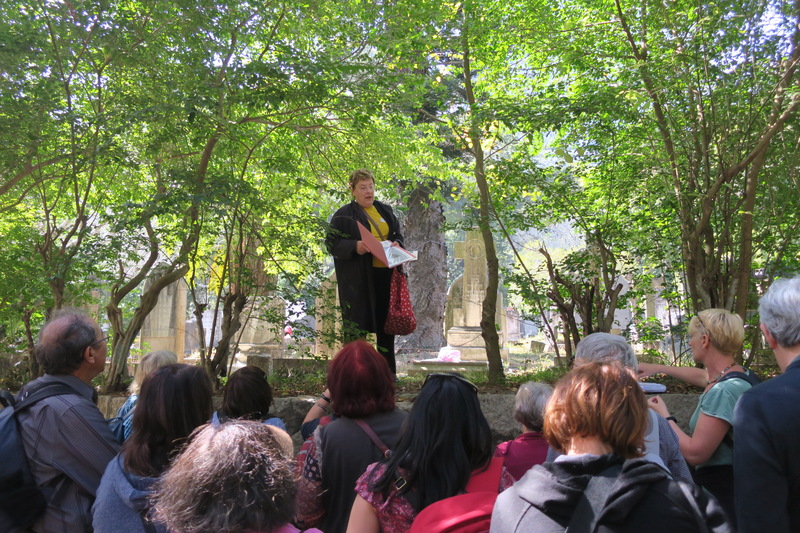 Finally, a big thanks to our 2018 tourers – Megan, Kerry, Pauline, Leanne, Natalie, Susan, Richard, Ann, Sally-Anne, Yvonne, Lyn, Kevin, Sarah, Robbie, Janice, Alice, Dalys – for the things each one of you brought to the tour. It’s a joy and a privilege to be able to share these experiences with you! Chung Mow Fung arrived in Melbourne in 1857 as a single man and left nearly forty years later in 1895 to settle in Hong Kong together with his Chinese wife and a large family of eight surviving colonial-born children. Twenty-five years of constructing a family in country Victoria had seen Chung Mow Fung and his wife Huish Huish negotiate between Australian and Chinese culture and between ‘traditional’ and ‘modern’ values especially in the area of gender roles. 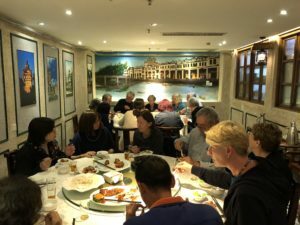 Settlement in the complicated liminal space of Anglo-Chinese Hong Kong allowed the family to identify to varying degrees with the different parts of their cultural formation. 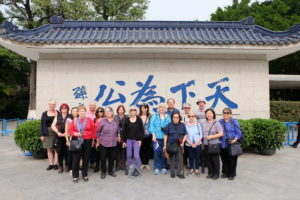 Their Australian background was acknowledged and their life-style was largely westernized but some members of the family became involved in the Republican era in the struggle to change aspects of Chinese culture, especially the role of women. This paper will examine how the Australian childhood of the family members played some part in how they, especially the women, lived out their adult lives while also retaining a strong commitment to their Chinese heritage. 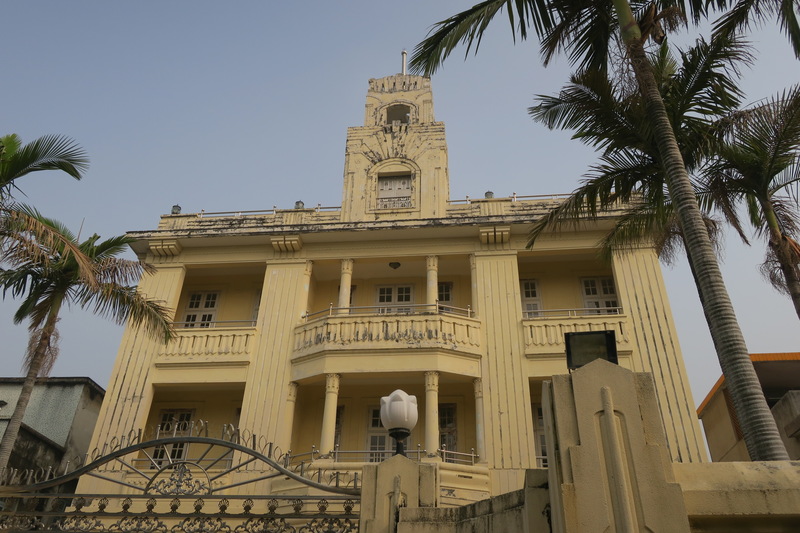 Pauline Rule undertook postgraduate research on the Bengali intelligentsia and then the social history of Calcutta during the period of the British Raj. She worked in both the curriculum and assessment areas of the Victorian Curriculum and Assessment Authority and its prior manifestations. 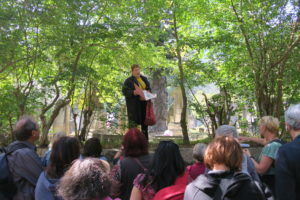 She has also researched and written extensively about the experiences of Irish women in nineteenth century Victoria. 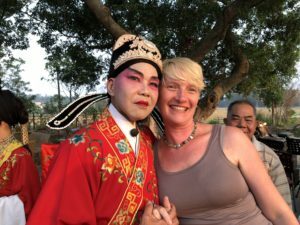 As part of this research she has examined marriages between Irish women and Chinese men in colonial Victoria and the outcomes for some of these families. This has lead to an interest in those Chinese women who came to Victoria in the colonial period. 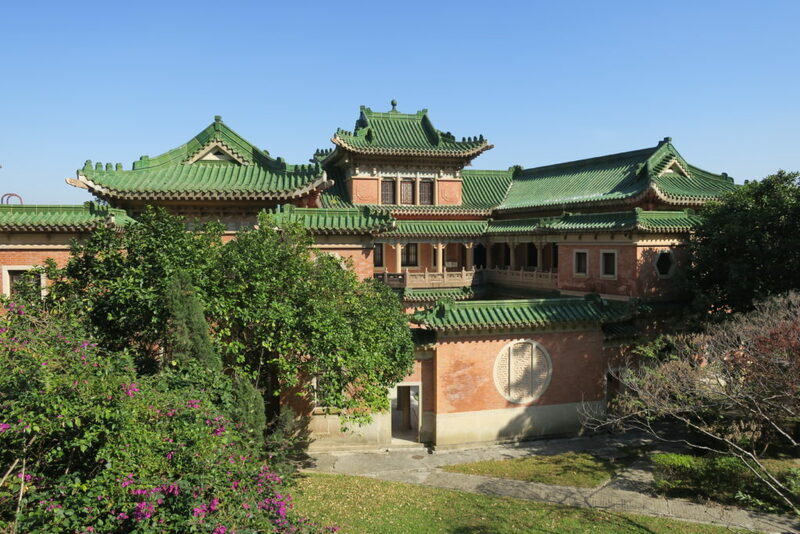 Hong Kong University Theses Online does just what it says – provides online access to theses completed at the University of Hong Kong. You can browse by degree or department and, unlike many other similar online thesis sites, this one provides full-text searching. There’s much of interest here – including a number of theses I’ve wanted to read for a while – and it’s all available free of charge. Hooray. 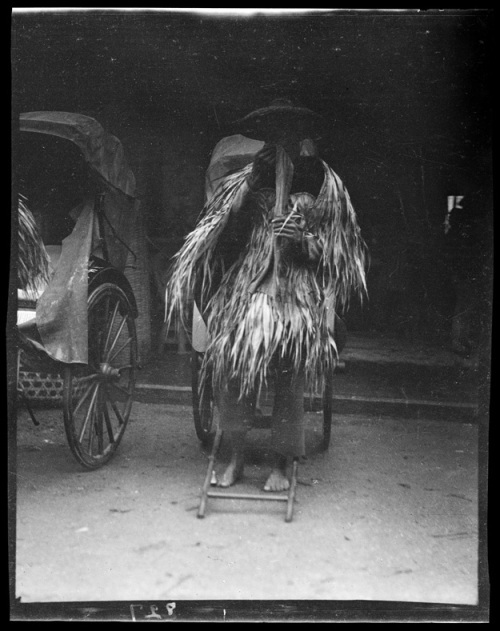 From 1908 to 1932, Sidney Gamble (1890-1968) visited China four times, traveling throughout the country to collect data for social-economic surveys and to photograph urban and rural life, public events, architecture, religious statuary, and the countryside. 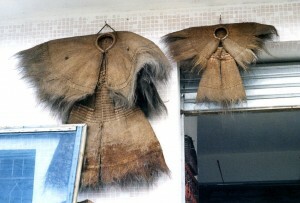 A sociologist, renowned China scholar, and avid amateur photographer, Gamble used some of the pictures to illustrate his monographs. 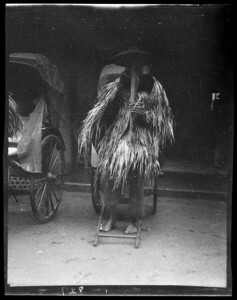 The Sidney D. Gamble Photographs digital collection marks the first comprehensive public presentation of this large body of work that includes photographs of Korea, Japan, Hawaii, San Francisco, and Russia. There are images from Hong Kong, Macau, Guangdong and Fujian. Also a nifty interactive map. As I was looking through the Guangdong photos, my eye was particularly taken by this image of a rickshaw driver in a fantastic raincoat. 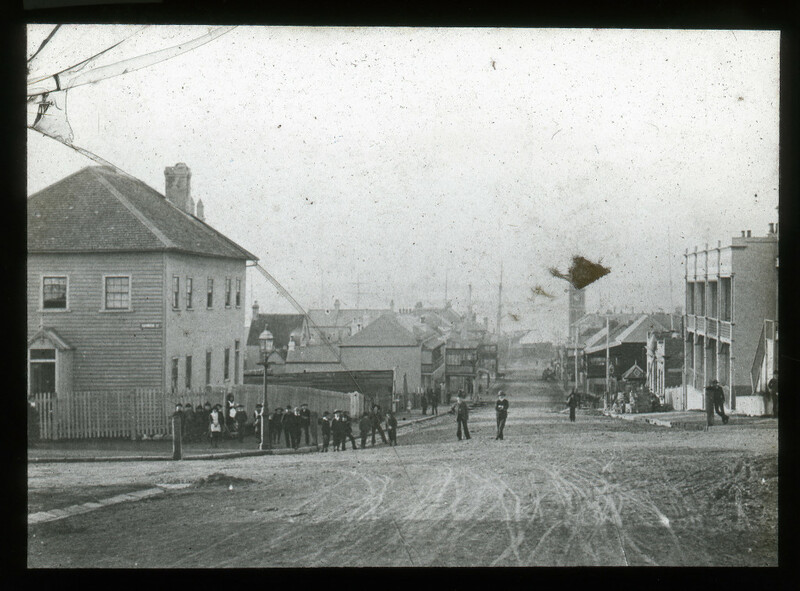 It was taken between 1917 and 1919 in Canton. It reminded me that on one trip to China, I spent some time exploring the ‘antique’ furniture markets in Tanzhou, Zhongshan, just outside of Zhuhai. (The no. 31 bus from Zhuhai went there.) 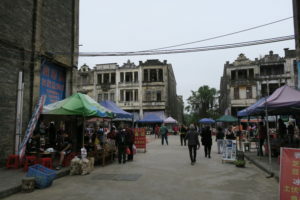 The markets are a mixture of small shops/factories that produce ‘antique’ Chinese furniture and other shops that have genuinely old stuff. These raincoats were hanging outside up outside one little place – one is adult-sized and the other child-sized.